By far the biggest player right now is Nest. 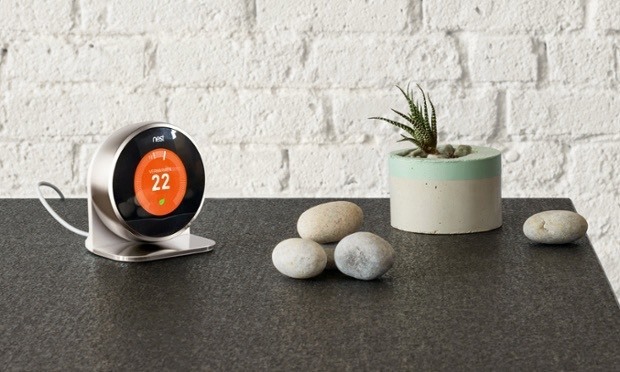 It was acquired by Google one year agofor $3.2bn (£2.1bn) and has become the poster child for the smart thermostat invasion. It is easy to see why. Smart thermostats are typically set up by professionals (the route we took with all models) unless you are highly proficient at DIY, but once up and running the Nest Thermostat is easily the simplest to use and the most visually appealing. It is also competitively priced. The ‘secret sauce’ is its smart learning. A motion sensor detects when you are home to automatically learn your schedule and never be caught out by an impromptu business trip or holiday. You can manually control the thermostat (and, optionally, your hot water tank) on its attractive display, via smartphone app or web browser, and it learns fast. The result is a minimalist device which you can quickly forget about. Because it learns from every manual temperature adjustment you make the heating is never on when you don’t need it – and it will even read weather reports to adjust for hot or cold days. Testing the Nest Thermostat in winter I found roughly a 20% decrease in my heating costs compared to the previous year with a standard ‘dumb’ thermostat. With a growing ecosystem that includes Nest’s ‘Protect’ smart smoke alarm (providing alerts from anywhere) it is likely to remain the big fish for the foreseeable future.